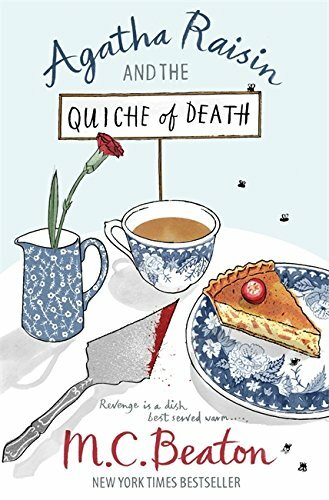 Agatha Raisin is the sort of neighbour you don’t want to live next to, if you live in a quiet picturesque Cotswold village where nothing ever happens. A newly-retired PR executive, Agatha arrives in the village of Carsley expecting a quiet retirement, a dream-like existence. But once she arrives in her perfect but soulless interior designed house, she finds real life in Carsley is not as she expected. First of all, no-one likes her. Second, no-one seems to give a fig about who she is. Third, she is bored. And so begins the first novel in this addictive series by MC Beaton, featuring busy body Agatha who things just seem to keep happening to. Desperate to make friends, she enters a village baking competition. Except Agatha can’t bake. So she buys a quiche and enters it as her own. So what, you may think. Lots of people probably do that. But when the competition judge dies of poisoning, Agatha is the key suspect. Desperate to clear her name, she turns detective. And so a new crime series is born, featuring an overweight, pompous and self-important woman who always thinks she knows best. Why is this series so good? Because Agatha always gets her come-uppance and the story is very funny. A circle of village characters – her cleaner Doris, the vicar’s wife Mrs Bloxley, the deliciously disgusting elderly couple the Boggles, the real policeman Bill Wong – and London PR friend Roy, all contribute warning voices when Agatha gets carried away with her theories. And, there are lots of references to Agatha Christie. A policeman warns her: “You really must leave investigations to the police. Everyone has something to hide, and if you are going to go around shoving your nose into affairs which do not concern you, you are going to be hurt.” In true Agatha fashion, she ignores him. This is a long series, lots more to read. For information about the other Agatha Raisin books, click here for MC Beaton’s website. I’ve never heard of these books but by your review, they sound charming. Thanks for a great and tempting review.